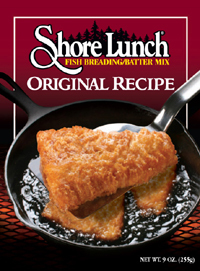 Old Guide's Secret Shore Lunch Fish Breading/Batter Mix - Original Recipe. Our Original Recipe breading was the secret ingredient to successful Shore Lunches in the northwoods. This formula was passed down from one generation to the next, until it was commercialized for wider sale in the 1980s. Since then our product line has expanded considerably, and items once available to outdoors enthusiasts only have been adapted for use by outdoor and indoor cooks. Also goes well with chicken, pork,venison, and seafood! Now available in the Large 3.5lb Family size!